Scored this at last years Model X show for $35 which I thought was a bloody good price. I've been rather keen to build it, so now that the F-14 is done I thought I would crack into this. Hopefully it will be alot easier and quicker than the F-14! Starting with the usual cockpit and internal stuff, this is what I have done so far. Awesome choice Fritz. I'll be following closely. I would love to do another squawk. Really want to get that eduard Vietnam scooters release. That is looking great, cockpit looks awesome. Hasegawa's A-4M is a very nice kit, and looks like a great job on the cockpit. Looking forward to watching this one. The mounting cylinder for the left landing gear leg moulded in to the wing is actually about .6mm deeper than the one for the right gear. 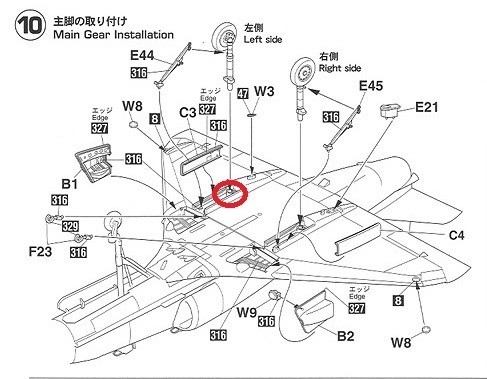 What this means, is that if you build the kit with the issue uncorrected, the left wing of your A-4 will sit around 2-3mm higher than the right. I have circled in red below the offending portion that needs to be shortened around .6mm. The fix from Craig is easy as to do. Looking good so far Fritz, they are a neat little kit! No major problems with intakes, but I test fitted and sanded as needed. Still working on this.... slowly...very, very slowly. It's all together now, need to clean up a few more seams and do a bit of rescribing. So far this kit has been a joy to build. I am definitely keen on doing another one, but in an RNZAF scheme. I would like to add some ordinance to this build, just need to figure out what they used? What Scheme will you finish it in?? Thanks John. Undecided at the moment. Leaning towards a low vis scheme, but I am liking the high vis ones as they are a little different. Slow and steady is ok, don't want to rush these things. Getting there - that's looking good. Weapons wise, there's quite a wide selection from standard dumb bombs through to Maverick and Walleye. Always thought this was a cool photograph. Thanks guys. I didn't think of adding Mavericks to it. Might look into that! Nice work so far on a beautiful little kit. I finished one a few years back and have been meaning to build another one... although I've had my eye on one of the Trumpeter 1/32 kits. Nice subject, all scooters look good, and these US schemes are awesome! Those trumpeter 32nd kits do look nice, would love to get one, one day. Small update. Sorry for bad pictures, to lazy to get big camera out. Just applied the intake lips. Not entirely happy with them as there is a bit of a step, and the fit didn't feel great either. Had a look at a few pics and it looks like I will need to putty the seam up, and make it more smooth. 90% done on the landing gear, just need to apply a wash.
Other than having to clean up the intake area, it's pretty much ready for painting! I managed to get the intakes sanded last night, so hopefully tonight I can get the black down and prep it for painting! Hey mate, I'll look to see what I have spare from my build, and I also have the Eduard Vietnam Scooters release and you're welcome to whatever decals are spare from that. I'm going to look at starting it this week, but it may be a while before I'm finished. Awesome, thanks Grover. I may be able to soldier on with it now. After giving myself a break to cool down, I just had another look at it to see if I can fix it. I just realised the underside colour is the same colour as the decals! It won't be perfect but I'll touch up the offending areas and continue on. It wont be a show piece but it will look fine in the cabinet. Some pics below of what I have been doing on it. This decal here was an absolute prick! I tried 3 times to get it to go down. I used lots of mircrosol and even Tamiya X-20A and this was the best I could get. If anyone knows a better way to tackle this decal, let me know! Nice progress mate. How'd you handle the decals around the speed bakes? They were real easy. They were cut out to fit around the speed break on the decal sheet. The worst was the wing and the band of colour around the intakes. Fritz wrote: Awesome, thanks Grover. I may be able to soldier on with it now. I reckon you've done a great job here. It's a pretty hard place to get a decal to sit. Were these kit decals or aftermarket? As for tips, I've found some decals (Hasegawa and Tamiya in particular) like really hot water. I sometimes dip a rag into very hot water and press that onto the decal. Thanks Calum. These were the kit decals. I did actually use near boiling water on this one. It seemed to have softened it a bit, I just couldn't get it to go down properly. It was best out of 3 attempts. That's looking excellent - I'm a sucker for lo-viz USMC jets as everyone here probably knows by now and like what you've done with this. I think the wing decal is a pretty good result and about as good as I've ever been able to achieve over those vortex generators. Maybe touch up with some matching paint. I did try X20A seems to work alright. Just have to be careful not to get it on the paint work if you are using acrylics.